I am a 22-year old young commerce graduate, who has completed her 16 years of education from women only educational institutes. I am highly passionate about serving the women community and society as a whole, with a mantra of “Service Above Self”. I lead Open Your Eyes (OYE) Foundation, an organization that envisions a gender harmonious world with its three-tier holistic approach through Gender Sensitization workshops and activities, as Community Engagement Intern. While working with Delhi OYE, I have been able to mobilize 5000+ females in Delhi only and have done Direct Mobilization and sensitization through community visits and by organizing various Gender Workshops at College and community level. 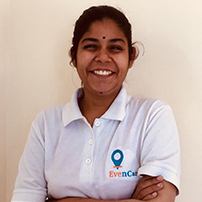 I am the Core Team member of Even Cargo-India’s first women only E-commerce logistics delivery company and look after bringing women in non-traditional sector. My major focus lies in building a gender inclusive workspace by designing policies and conducting awareness sessions at various places. I work exclusively in building the capacity of these Young females through strategic investment in their leadership, leading to social-cultural and economic inclusion of these females.